"Works pretty much out of the box, plug it in, download/install drivers and away you go. No problems with this device. 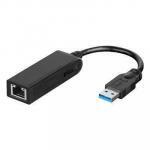 Been using it for a few weeks now on a laptop that had no built in NIC in order..."
- Supports the built-in power-saving features of the USB 3.0 standard. Especially useful for battery-powered notebook and ultrabook computers.